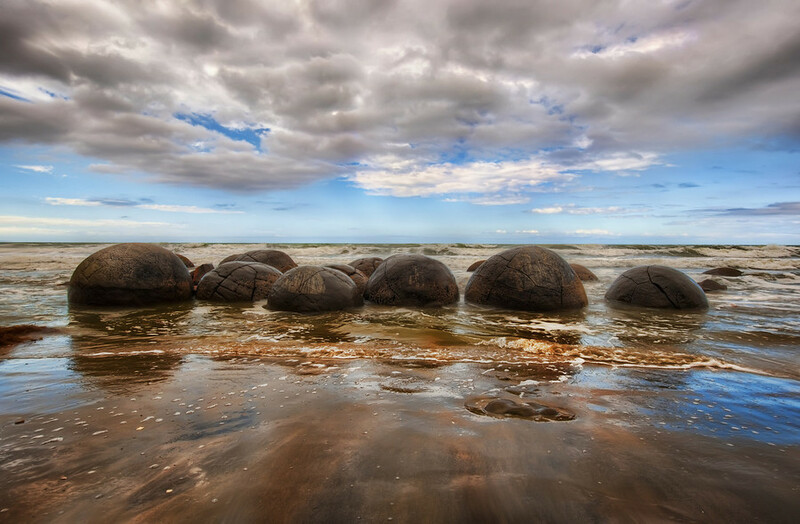 The above photo is one of Trey Ratcliff’s photos of the famous New Zealand Moeraki boulders, check out his post that goes along with the photo here. A visit to the Moeraki boulders is on my list of places to visit and I’ve been toying with the idea of an extended visit to New Zealand to photograph the boulders and all things New Zealand. My biggest fear about any trip is that I’ll not get ‘the shot’ and will have wasted my time which generally ends up with my doing a mountain of research before I go. I’ve written about ‘virtual scouting‘ before and I continue to use this method while looking for additional tools that would be useful. One tool that I’ve been playing with recently is Trey Ratcliff’s iPad app Stuck on Earth. It seems to be a cross between Flickr and Google Earth. You can use the app to navigate to pretty much any interesting place on the planet and see what other photographers have achieved. I can’t wait for it to be available in other formats.